While Notorious certainly was not Alfred Hitchcock's first movie (he'd been making movies in England since the 1920s) nor his American debut (that would be Rebecca in 1940) it would be considered by many as Hitchcock's "watershed moment". The Master of Suspense had already worked with the likes of Cary Grant and Ingrid Bergman but it would be Notorious that would bring these two stars together with spectacular pyrotechnics. Their onscreen chemistry, under Hitchcock's masterful direction, would be the stuff of legend. Notorious is a spy thriller set in Post-War Brazil and stars Bergman as a young promiscuous American woman recruited by Grant's intelligence officer to help infiltrate a secret cabal of Nazi sympathizers. Along the way the two complicate things with their growing feelings for each other as the young woman must choose just how far she's willing to go for the sake of the mission. Choosing Nazis as your villains, by the way, is a sure way to gain the audience's sympathy without even trying. Claude Rains rounds out this stellar cast as the unwitting mark in this complex confidence game of international espionage. The film marks the moment when a master obtained his mastery of his craft. Its bold and unconventional strokes set it head-and-shoulders above Hitchcock's contemporaries. He strove to make movies that were thrilling and full of suspense but also conveyed a deeper insight into human psychology. He wasn't a mere panderer of cheap thrills but neither was he a pretentious cineaste. He was of that rare breed of filmmaker that achieved balance between what our eyes crave and what our hearts need. The word around town was that Alfred Hitchcock was a meticulous planner and, therefore, an unwavering professional. Every shot (literally) was planned months before even one frame of film was ever exposed to the shutter. You could say he was a director who held to Sun Tzu's maxim that, "Victorious warriors win first then go to war, while defeated warriors go to war first and then seek to win." Hitchcock is also closely associated with the development of the auteur theory. Or, rather, his works were sited numerous times as proof that films carried the distinct fingerprint of its director. 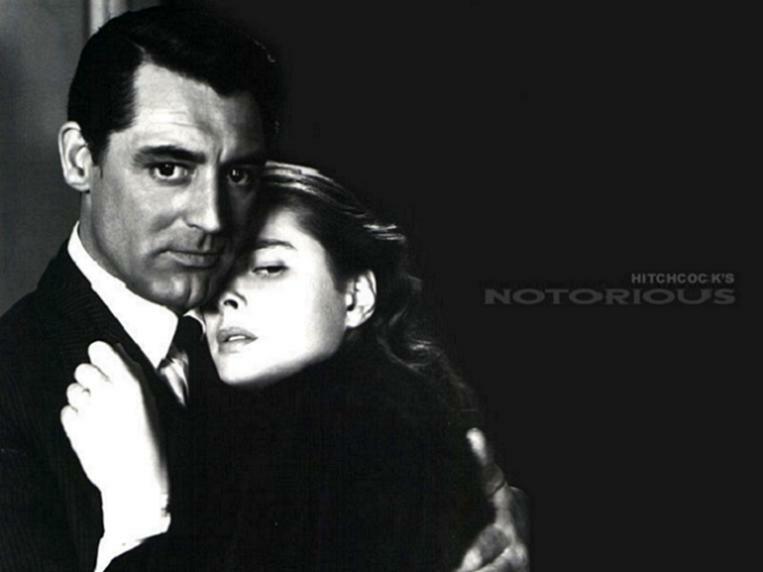 Whether you agree with the auteur theory or not, one cannot deny that Notorious is rife with Hitchcockian genius. His use of the long crane shot-to-close-up as a way of bringing attention to a plot device, the use of exaggerated or gargantuan foreground elements to convey an overpowering oppressive force, and his insistence on using beautiful blondes as his female leads are all hallmarks of an Alfred Hitchcock film. This week saw the release of Notorious but you can also get recent re-releases of Rear Window, Vertigo, and Psycho on DVD. Now, if only they'd do a proper release of North by Northwest, the old Master of Suspense could rest easy.